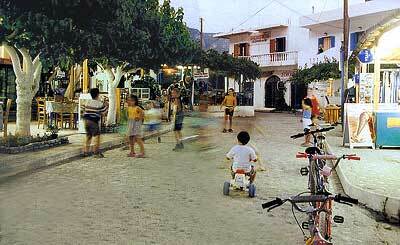 What to do in Agia Roumeli , its nature and customs. With the mountains so close there are endless possibilities for hiking routes, such as the path up to the two ruined castles, situated on the nearest western hillside of the village. The view from the castles is superb. With the exception of the Samaria Gorge, this region has not been systematically mapped or explored by official trekking groups. Therefore, visitors are provided with the unique experience of having this information shared to them by the locals and being part of the very few who have walked these mountains. The brothers Roussos and Spiros Viglis will be very happy to share routes, helping organize hiking excursions and telling personal stories about their own experiences in these mountains. They were born here, in the old village, and know the surroundings like the back of their hands. Last but not least, visitors will want to have a look at the gorge of Samaria. It is not difficult to follow it upwards from Agia Roumeli and starting in the early morning, one can enjoy this beautiful gorge almost privately, alone in nature. Eventually, one will come across walkers coming down from the other entrance of the gorge Omalos. Two km from Agia Roumeli and right before the official entrance to the protected national park of the gorge, there is the old village of Agia Roumeli. Here more recent history of the village is visible. It is interesting to see how old it looks while in actuality it was a big and lively place until only 40 years ago. The inhabitants of the old village started to leave after 1954 when the river flooded and many houses ruined. After that, the new village was slowly built up down by the seaside.